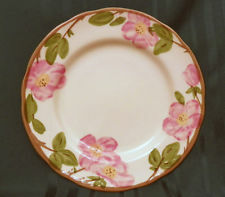 Desert Rose dinnerware is a pattern of the Franciscan dinnerware brand. First introduced in 1941, this embossed dinnerware pattern has become a favorite of collectors. 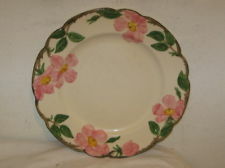 The pattern features embossed roses on hand painted dinnerware. 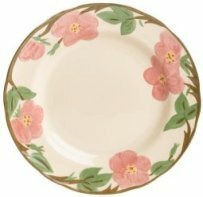 A lot of people mistakenly call this pattern an antique dinnerware pattern, because it is collectible dinnerware; however, it hasn't been around long enough to be antique, so it falls in the category of vintage dinnerware. If you intend to collect this dinnerware, knowing the history of it will help you decide if you want currently produced dinnerware, or vintage dinnerware, and the average years of production for your collection. 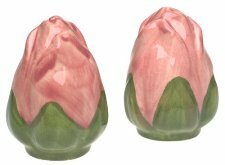 Originally, this pattern was made by an United States-based company, Gladding, McBean and Company, who made the pattern popular. Later, after a company merger, the dinnerware was produced by a company named Interpace. In the 70s, the company sold the Franciscan division to Wedgwood and in the 80s, the California factory was closed. At that time production of the Franciscan dinnerware brand was moved to the Johnson Brothers division which was located in England. Shortly after the move, Wedgwood was bought by the Waterford Glass Group plc, who renamed the company Waterford Wedgwood. After another requisition, the company became known as Wedgwood Waterford Royal Doulton (WWRD) and the production of the dinnerware was moved to Asia. To tell the age of Franciscan dinnerware, it is best to learn the back stamps that were used over the life of this dinnerware pattern. This will help you to determine whether your dinnerware was made in the United States of America, England or China, if that matters to you, plus the range of years that is was most likely produced. Collector guides and price guides contain valuable information for collectors of dinnerware. If you are looking for vintage dinnerware, it is less common that you will be able to buy a full set. You might get a partial set by searching for the pattern name with vintage at the beginning on the eBay website . If you can't find a full set, at least you can pieces to complete a set. It seems that the Desert Rose pattern is always listed. Another option is to search for the pattern name with the preferred country of production or the pattern name with a year range. You will see a slight difference in the pattern depending on the era of production. The images above, though not clear enough to be comparable, feature dinnerware made in the USA, England and China, in that order. 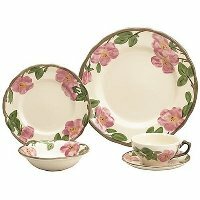 Most currently available Desert Rose dinnerware sets are made in China under the Franciscan brand name.